Morbid Anatomy: This Saturday, May 18th: Celebrate The London Hunterian's 200th Birthday With Lectures, Reception, and Book Release Party for "Medical Museums: Past, Present and Future" With Chapter by Morbid Anatomy! This Saturday, May 18th: Celebrate The London Hunterian's 200th Birthday With Lectures, Reception, and Book Release Party for "Medical Museums: Past, Present and Future" With Chapter by Morbid Anatomy! This Saturday, May 18th, London's Hunterian Museum will be celebrating its 200th birthday (!!!!!) with a series of lectures, a late view of the new exhibition, and a reception and party for their new, lavishly illustrated and utterly essential collection of essays showcasing medical museums around the world entitled Medical Museums: Past, Present and Future. The lectures--which begin at 4:30 PM--and reception and late view--beginning at 6:00 PM--are free but require a reservation; a special dinner beginning at 7:30 PM will run you £65; you can RSVP for all at 020 7869 6568. The book--whose cover you see above--was edited by Hunterian director Samuel Alberti and Dr. Elizabeth Hallam, Universities of Aberdeen and Oxford to commemorate the museums' bicentennial, and is richly illustrated with hundreds of photos of many of the worlds most wonderful medical museums. You will also notice a wee chapter of my own, which features many never before shared photos of medical museum back rooms. You can find out more about the book in the following press release, and can order a copy by emailing shop [at] rcseng.ac.uk or calling 020 7869 6562. Hope very much to see you at Saturday's festivities! 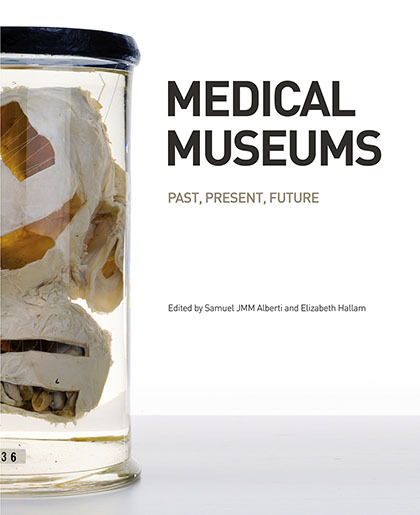 This book brings together a unique collaboration of curators and scholars from Europe and the United States to open up new perspectives on the past, present and future of medical museums. Offering readers unrivalled access to international collections of preserved animal and human bodies, instruments and art, Medical Museums features many previously unpublished images and untold stories from this fascinating and disturbing world. Medical Museums is a bold, eclectic anthology that offers readers a unique opportunity to experience this compelling heritage through clearly written, well-informed text and sumptuous images. Insightful essays informed by current debates in medical history, anthropology, museology and visual studies are complemented by astonishing images provided by both well-known and niche museums from around the world. With unparalleled coverage provided by curators, the 17 richly illustrated chapters explore collections from Aberdeen to Zurich including: Berlin (the Charité), Cleveland (the Dittrick), Copenhagen (the Medical Museion), Edinburgh (Surgeons’ Hall), Florence (La Specola), Leiden, London (the Hunterian Museum, the Science Museum, and Wellcome Collection), Philadelphia (the Mütter), Stockholm (the Karolinska Institute), Washington DC (the National Museum of Health and Medicine and the Smithsonian). Published by The Royal College of Surgeons of England to commemorate the bicentenary of the Hunterian Museum. You can find out more about the events here, and order a copy of the book by emailing shop [at] rcseng.ac.uk or calling 020 7869 6562.